Stories have a clear beginning, middle and end and solve a problem, sometimes a dramatic peripeteia and sometimes a small conundrum. Stories are explicit, told and retold. 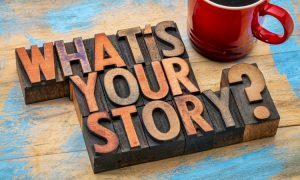 Narratives are a story made up of many stories and may not have a clear end, and may not have a clear problem or may indeed have many problems within. Narratives are often unseen, unnoticed, unanalyzed, and powerful shapers of human experience. 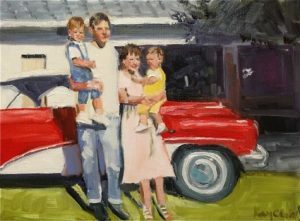 Take, for example, the American Dream… this is a narrative, one that is manifest in many different contexts… the media, folklore, social institutions. It is made up of many stories, some of them also possibly narratives. Stories within the American Dream are about work and effort and the relationship between the two; about opportunity, fairness and equality; about rights and responsibilities; about meritocracy and privilege; about democracy. It is a complex narrative which contributes to its power. There is the telling of a story and the hearing of a story. Researchers often focus on telling the story, whether it is an individual, organizational or cultural story. If narrative is a fundamental as Jerome Bruner and others say it is, then both parts… the telling and the hearing… are equally important. Story telling (narrative) that embraces the goal of social change requires both. harnesses the power of the story exchange to equip and embolden young adults to improve their lives, communities, and the world. Narrative 4 projects focus on the environment, identity, immigration, faith, and violence, and capitalize on polar opposite life experiences and values. They have organized story exchanges with Jewish and Arab teenagers; survivors of the 2010 Haitian earthquake and Hurricane Katrina; victims of gun violence and gun advocates; students from poor and elite schools; intergenerational experiences; students and police. PhotoVoice is another methodology that has potential to explore narratives that foster awareness and change. Images that tell a story of lived experience are communicated in public presentations to inform and compel attention be paid to social change. Other participatory research approaches can and do incorporate story telling. 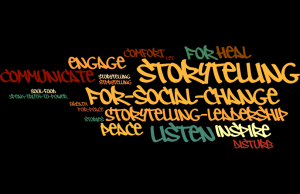 Many non-profits offer guidance for using story telling to support social change. Perhaps inadvertently, Joseph Davis provides an excellent example of narrative inquiry in his article, No Country for Old Age. This is a cultural narrative, a story of how life is and ought to be lived… a story of what it means to age, and as Davis points out this is a hegemonic narrative, one that compels us to be a certain way. In our society, to come directly to my point, old age is understood and framed in ways that lead inevitably to its devaluation. Its status is low and arguably is falling. Davis looks also at other sources of this cultural narrative about aging… the pathologizing of aloneness into an epidemic of loneliness and the extreme medicalization of aging. Loneliness has become a disease, one that will hasten your death and therefore must be warded off by vigilant attention to maintaining a social network as the antidote. This “loneliness” is caused by social conditions like high divorce rates, more single parent families, fewer close family networks. As loneliness is medicalized, so in general is aging. Rather than a phase in the ebb and flow of life and death, being old is an illness (one to ward off as prescribed in blogs) and one that makes older people ever more medically scrutinized. Barbara Ehrenreich’s book Natural Causes analyzes this same narrative. 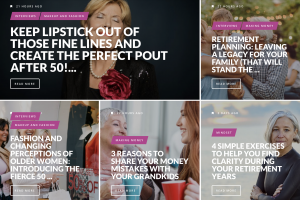 This is a narrative supported by stacks of self-help books aimed at the aging (including Ehrenreich who is 76) telling them to think in terms of “active aging”, “productive aging”, “anti-aging”, even “reverse-aging.” A long life is promised to anyone who makes an effort, regardless of factors such as genetics or poverty. 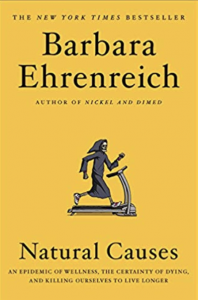 Ehrenreich focuses especially on health checks, not those that are in response to obvious symptoms, but those that search for hidden problems… tests that lead often to false positives and over diagnosis… bone density scans, dental x-rays, mammograms, colonoscopies, CT scans. In part the medicalization of aging is a lucrative business and this is especially true in the US where many older people have health care coverage for the first time in their lives. With a PhD in cellular biology she provides more than a cultural critique. Current constructions of old age in individualistic terms of self-reliance, the fit body, productive accomplishments, or an imperative to deny or defeat aging technologically cannot but deepen our predicament and the need to render it invisible. This narrative of aging is hegemonic, it frames a normative way of being that is difficult to resist and overcome. But, many experience aging not as a failure and consciously chose a different narrative, one that sees aging as something other than a poor approximation of youth. Aging sets limits, often vulnerability and dependence, or as Ehrenreich says, “an accumulation of disabilities,” all of which might be framed not in terms of youth but rather the ethic of a well-lived life. Narratives of stages of life are profound and powerful, they are culturally constructed and often become hegemonic… fortunately, human storytelling abilities opens possibilities to overcome their oppressiveness. 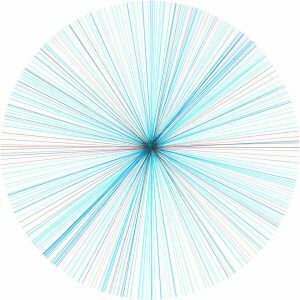 Online QDA is a good resource to orient yourself to what computer assisted data analysis is and is not, preparing data for various software programs, and coding. This site has videos, details about the most commonly used software packages, and useful references throughout. Interviews are a series of questions and answers and as social scientists we presume both use words. More common in the arts community is the possibility answers can be entirely or partly in the form of drawings, illustrations, images. Thinking about illustrated interviews within social science opens possibilities in forms of thinking and representation that often go untapped in interviews. 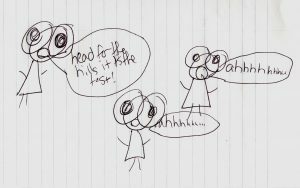 Asking interviewees to draw pictures that become part of interviews is a strategy I have used with children. 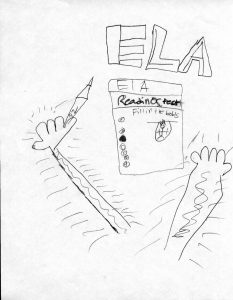 Studying the impact of high stakes testing on children, I asked them to draw a self-portrait whilst taking the test. 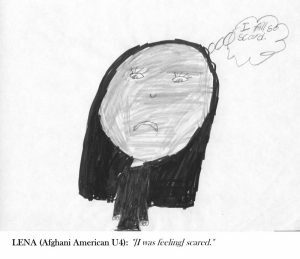 They also wrote a caption for the self-portrait and these drawings were used to engage the children in an interview about their experience. In this same study, children kept journals and were encouraged to write and draw. Not every child drew but most did at least some of the time suggesting the flexibility to chose how they represented their experience enhanced the likelihood of authentic sharing. You can read a report of this research here. The NYT does a series of illustrated interviews… asking simple questions and having celebrities draw responses, which are then modestly animated resulting in a sense of action. Some interviewees are skilled at drawing, many are not. The interviews share a common set of questions and thus reveal a “life” for each person. There are examples of drawings that represent concepts or ideas, like Jennifer Burtchen’s drawings of time, her drawing of the “present” shown here. This is one of a series of illustrated interviews in the magazine Ignant. 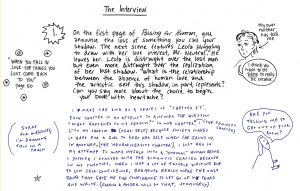 Liana Finck and Amy Kurzweil are both cartoonists and in this interview about a book written by Finck they use drawings in the margins of a more typical Q & A format to amplify the written responses. There are many examples of using drawings when doing research with children, but this strategy can work with adults as well. I use this prezi when I teach about research ethics. This issue of Forum: Qualitative Social Research has an extensive special section on research ethics. Topics include: conceptual frameworks, ethics codes and research review practices, and ethical issues in many different particular research contexts (indeed, most of the issue focuses on ‘ethics in practice’). 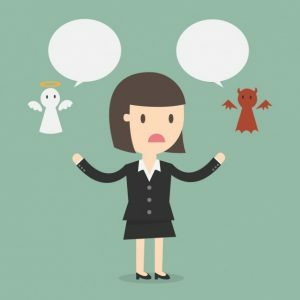 The present collection of studies concerning ethics in qualitative research bears testimony that the research community has come a long way from where it still had been in the 1960s, when research was conducted that obviously harmed participants and bystanders. It is exciting to see that qualitative researchers tend to treat ethics not as a code but as a characteristic of the relation between researcher and researched. Once we consider the relation as an event (rather than thing), it is immediately apparent that ethical questions never are resolved with some formal institutional approval of the research. Instead, ethical questions are aspects of human life and relations and thus continuously pose themselves anew, remain for a while, and die away only to be reborn again in some other form. It is relatively easy to mix methods at the methods level, i.e., when the intent is to collect both quantitative and qualitative data. This can be accomplished within a single method. For example, you might use observation as a method and use an inventory to record frequency of behaviors, interactions, and so on. You could also record dialogue or take field notes occurring during this same observation. But this strategy may also mean using a method that generates numbers (likert scale item survey) and a method that generates words (oral history interview). Mixed methods research wants to move beyond this simple distinction of types of data and the field makes an effort to elevate the idea to a methodology, even sometimes crossing the epistemological boundaries of objectivism and social constructivism. A research study that uses interviews and participant observation, for example, is now not necessarily considered mixed methods research. Whereas, a research study that uses hermeneutics and times series analysis would be a mixed methods study. These different contexts also suggest the “mixing” can occur at different places within the research process. A primary justification for mixed methods is pragmatism. 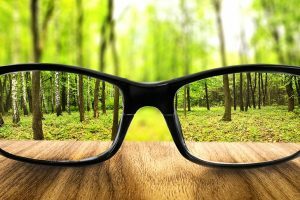 Pragmatism asserts no first or foundational principles and suggests that all human knowledge is empirical, what John Dewey called “empirical metaphysics.” I confess to being unclear how the philosophical position of pragmatism is a justification for mixed methods—how does the primacy of experience lead to any particular methodology or method? 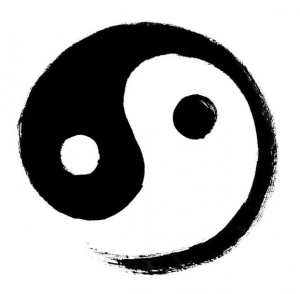 And, is this a confusion of pragmatism with being pragmatic? Related to this pragmatic justification is the triangulation justification, especially more contemporary notions of triangulation that focus on the complementarity and complexity added by multiple data sources, analyses, and so on. See my discussion of triangulation along these lines here. Feyerabend’s “anarchist epistemology” might also justify mixed methods, either within the same study or across studies of the same or similar phenomena. This is in the big picture a more dialectical approach, working iteratively across paradigms rather than necessarily combining paradigms. Bergman, M. (2008). (Ed.) Advances in mixed methods research: Theories and applications. Thousand Oaks, CA: Sage. Creswell, J. W. & Plano-Clark, V. L. (2018). Designing and Conducting Mixed Methods Research (3rd ed.). Thousand Oaks, CA: Sage. Tashakkori, A., & Teddlie, C. (2010). Handbook of mixed methods research. Thousand Oaks, CA: Sage. Teddlie, C., & Tashakkori, A. (2009). Foundations of mixed methods research. Thousand Oaks, CA: Sage. Coding is the basic building block of analysis, and while it seems straightforward to code your data, it usually turns out to be quite mysterious. So codes can serve many purposes, and even within the same analysis often do serve many purposes. We are often examining the trees, but with an interest in seeing the forest. Perhaps most commonly we use codes to identify concepts/bigger ideas reflected in our data and then look for intensity of concepts and patterns among concepts. In addition, codes can be counts (of words, phrases, ideas); markers for magnitude (how much of something is present/absent, simplistically perhaps as high, medium and low); and organizational (keeping track of demographics, labelling particularly evocative quotes, or as bookmarks during the coding process). But these purposes should not be muddled together. Occasionally the question arises: how many codes do I need? There is no answer for this question, you need as many codes as you need for the purpose they serve. And, the number of codes evolves, ebbs and flows, in relation to answering the research questions posed within a particular methodological framework. Coding, again informed by the tenets of a methodology, may be done inductively (from the bottom up; from the data to theory), deductively (from the top down; testing a theory with the data), or most commonly abductively (moving iteratively back and forth between data and theory). This is a decision that needs to be made explicitly. Keeping track of codes, used for various purposes and changing, is greatly facilitated by CAQDAS… computer assisted qualitative data analysis software. A story map visually displays data in relation to places, location, or geography, and story mapping is the process of finding and analyzing the connections among human experience and place. Story maps can be simple or complex, low or high tech. And, story maps help in analyzing complex social issues such as human rights, climate change, refugee resettlement, student transcience, and community integration. 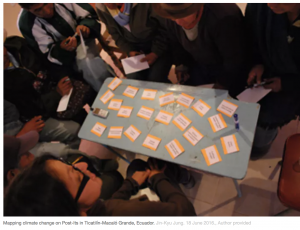 In a study of climate change, researchers worked with Ecuadorian subsistence farmers, used Post-It notes to facilitate a community discussion on climate change. Using a map as the basic reference, farmers in the mountainous central Ecuadorian province of Cotopaxi answered three questions: Has your community changed since you were a child? How has the climate changed since then? Are there any past climate-related events that affected you the most? Responses were posted to the map, illustrating connections between place and observed human (such as illness) and climate (such as agricultural pests) events. Using existing web based templates (like StoryMapJS) or even Google Maps a story can be build that illustrate events and relationships. These tools rely on a narrative that moves through geographical space and the flow can be in space or time and space. An example of the former might be a subway line or interstate highway along which events, places or people can be placed. This story map of the Green Line train in Minneapolis is a good example. A static map example is of Pioneer Square in Seattle as a center for Queer history in that city. An example that combines movement through time and space is a story map illustrating the shifting population throughout USA history. Often, story maps use GIS (geographical information systems) software, most commonly ArcGIS. Here is a link to Environmental Systems Research Institute, the most common portal for the use of this software, with illustrations from marketing, social science, and natural sciences. There are lots of examples on this website, but this story map of the experience of Rohingya refugees is a good place to start. Story maps are often web-based, which facilitates interactivity and reveals movement within the story. What applications might this have in educational research? Here are just a few ideas. Student mobility is an issue in the lives of some students, the quality of education received, experiences in school, and the experiences of schools. Mapping student mobility within a district or city combined with interviews, performance data, family characteristics, school environment and so on could provide insight into the experience of transcience and help schools plan better for the inevitability of student mobility. We know standardized test scores correlate as much with social class as with ability. Social class is closely linked to neighbourhoods and so mapping scores onto neighbourhoods, with additional information about income, types of housing, and cost of housing would reveal this relationship succinctly. Generally, one might examine issues of space and educational inequality. Inequality that stems from race, ethnicity, or special needs are geographically unevenly distributed and revealing that distribution in communities, districts, schools and even classrooms could be done with story mapping. Fifteen years after the Iraq War began, Magnum photographers are reflecting on being embedded with the U.S. military and how it affected the work produced during the conflict. While the practice of embedding journalists is not new it very much came to the public’s attention during the Iraq and Afghanistan wars, estimates are there were 700+ journalists and photographers embedded with American military troops. There is much controversy about this practice, some of which is highlighted in the Magnum photographers reflections. A key issue is the sympathetic and dependent relationship with the military, one that lead to what some journalists referred to as propagandizing. The same embedding strategy was used for anthropologists and other social scientists. Since 2007, the Pentagon’s Human Terrain System (HTS) started placing social scientists in every Army combat brigade, regiment and Marine Corps regimental combat team in order to improve the Army’s cultural IQ. The HTS has now been phased out, not because of ethical issues but because there were insufficient on the ground troops to warrant the program. Indeed, the protests of professional associations had little impact on the existence of the HTS. This article is a good summary of the HTS. 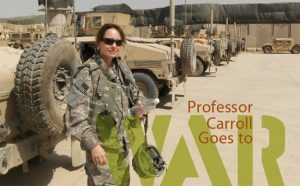 It is important to note, collaborations between social scientists and the military did not begin with Iraq, but have always been controversial. For example, Project Camelot, a program intended to help the U.S. Army assist friendly Latin American governments in dealing with insurgency as well as influence social and economic development, didn’t survive once it became public. Nonetheless, it is useful to ask what has been learned? The ethical dilemmas presented by embeddedness are significant. Basic premises of informed consent are by definition ignored and violated. It is critical to ask how the methodological and value traditions of social science might be compromised/affected by the invitation to participate by one side of the conflict in a military zone. Will cultural knowledge be used against those in the invaded country/region, for example? Is the work meant to create knowledge or intelligence? What is the relationship between social science and politics? What are likely consequences the work will be controlled by the military, in other words, what is the likelihood of becoming a legitimation of propaganda? These questions remain relevant because, at least on the military side, a desire to use the knowledge and skills of social scientists is still deemed useful, and there is the possibility the HTS has been reinvented under a new name, the Global Cultural Knowledge Network.